I am getting used to it now – Just as I start to think that the trail of historical intentional communities must be drying up another one pops up. Or in this case one thought to be dead springs back to life. I was recently up at Brantwood House, Ruskin’s former home at Coniston in the Lake District, where I came across a local history booklet on a Ruskin inspired community that I had tried to track down whilst writing my first book, Utopia Britannica – a community that at least one author I read had dismissed as never existing. John Ruskin (1819-1900) is perhaps best known for his defenses of Turner and the Pre-Raphaelites during the 1870s he produced an idiosyncratic monthly digest of his ideas entitled Fors Clavigera in the form of a series of letters to the workmen and labourers of Great Britain. Amongst the many personal anecdotes, Swiss folk stories, discourses on art and botany and promised recipes for a famous vegetable soup, Ruskin sketched out the framework for his own utopian world. It was a world where art and life were to merge as one. Money itself would be an object of beauty. Each trade and profession was to have its own distinctive costume. Work would be carried out by hand, without machines with their accompanying pollution. The mainly agricultural work would be interspersed with folk festivals. Ruskin conceived the Guild of St. George as a means of transforming the declining state of Britain into his utopian fantasy. “We will try to take some small piece of English ground, beautiful, peaceful and fruitful. We will have no steam-engines upon it, and no railroads; we will have no untended or unthought-of creatures on it; none wretched, but the sick; none idle, but the dead.” The Guild was to be a band of men of good will, giving a tithe of their income, and the best of their energies, to acquiring land, and developing it, in accordance with Ruskin’s ideas and ideals. A number of attempts were made by the Guild to put its ideas into action. At Barmouth on the Welsh coast a group of cottages and an acre of rocky ground were gifted to the Guild. Here Auguste Guyard an exiled French social reformer went some way towards achieving Ruskin’s vision of land restoration cultivating rare herbs and trees on hostile soil. At Cloughton, near Scarborough, a small plot of land was bought specifically for John Guy, a Companion of the Guild, who Ruskin admired for refusing to work a steam-driven machine. 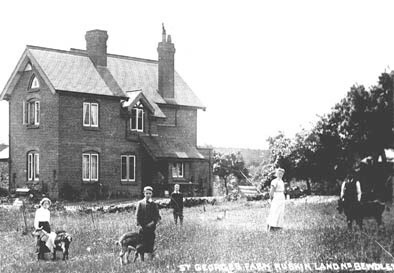 “A small body – about a dozen – of men calling themselves Communists, mostly great talkers, had joined together with the idea of establishing themselves on the land somewhere; and I have understood that it was at their insistence that John Ruskin bought the small farm (of thirteen acres or so) at Totley near Sheffield, which he afterwards made over to St George’s Guild ” Edward Carpenter. The Totley Colony went through various changes starting off as an allotment scheme turning into a land colony with a dozen members and finally being taken over by Ruskin’s head gardener from Brantwood as ‘ Mickley Botanical Gardens’ to try and show `the best methods of managing fruit-trees in the climate of northern England…..’ Before being sold. 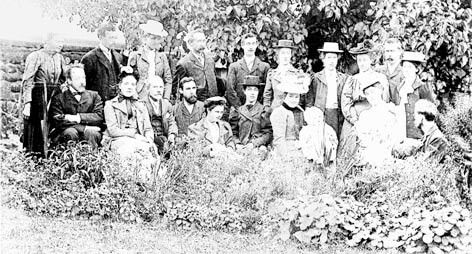 In Liverpool in 1883 a small circle of “earnest and idealistic young people” formed a group of companions of the Guild of St George and the following year they rented Mulberry Cottage in Wavertree. From this base they held discussion groups on a whole variety of topics – on Saturday afternoons they could be found engaged in earnest talk over tea, toast & rhubarb(!) on the events of the day or the books they were reading. In the walled garden behind the cottage they grew flax, wheat, fruit and flowers; they kept poultry, bees and, somewhat unsuccessfully, pigs. Edith Hope Scott looking back at the Mulberry Cottage years in her autobiography commented ” Looking at the Cottage Episode from this side of the war, it is half comic, half pathetic; to see how seriously we took to the idea of doing our share of the ‘dirty work of the world……. but we learned a lot of things at Mulberry Cottage; and it revolutionised our personal lives for some of us, and I think few who went there have not the marks of it left on their lives.” The limited space at Wavertree meant that some companions were frustrated by just preaching Ruskinian principles and demonstrating them on a small scale. They wanted to put them into practice, wanted to live them day in day out. In August 1889 Thomas & Margaret Harley set out from Mulberry Cottage for the Wyre Forest just outside Bewdley in Worcestershire. They were the first of five families who would settle on land owned by George Baker, a wealthy member of the Guild who had bought a large estate to develop to a plan guided by Ruskin. In the oak forest the families carved out smallholdings for themselves. Some bought plots, others settled on land that Baker gifted to the Guild and a community gradually grew up on the holdings known as; Atholgarth, St George’s Farm, Ruskinland, Uncllys and St Johns Cottage. The whole project had been given a kick-start in 1876 when George Baker had given 20 acres of land to Ruskin with the aim of reclaiming the land and building a museum. The museum was never built and it took a number of years before any work on reclaiming the land bore any fruit. (Which is perhaps where I had picked up the story that the scheme never got off the ground from.) But by 1880 a finely-drawn plan of the area shows a 190 tree orchard and records “Fifty plum trees being the gift of Mr Willett, two plums and two apples the gift of Mr Allan and the remaining 135 pears, cherries, plums, damsons and apples given by George Baker.” The pioneer families that came down from Mulberry Cottage established successful smallholdings planting further orchards on land they cleared in the forest. The holdings were developed throughout the 1890’s and the early years of the 20th century with building work and further land acquisition by the Guild carrying on right into the 1930’s. The story of the families involved is told in Ruskin and Bewdley by Peter Wardle and Cedric Quayle whose grandparents were amongst the early settlers. In the 1970’s the whole area became a National Nature Reserve because of its unique value as ancient woodland and is now carefully managed jointly by the Conservancy Council and the Guild. The Guild of St George is still going and active in a number of different fields. This entry was posted in Early 20th Century and tagged Guild of St. George, Ruskin by chris-coates. Bookmark the permalink.